“You may think that they’ve been around forever and you wouldn’t be wrong. Railway sleepers, the rectangular blocks that can be seen under railroad tracks, have not evolved much over the years. An Italian SME is looking to shake things up with a tailor-made, sustainable sleeper technology. Traditionally, railway sleepers have been made of wood or, later, concrete. But whilst these both proved their worth, they are not without shortcomings. Not only are they a major source of noise and vibrations, but they also require expensive maintenance. Ballast pulverisation, lateral displacement and lifespan are other major problems that Greenrail (Greenrail, innovative and sustainable railway sleepers: the greener solution for railway sector) set out to overcome. The Greenrail solution, which has been patented in over 55 countries, innovates with an inner core made of pre-stressed concrete and an outer layer made from a mix of recycled plastic and rubber from End-of-life tyres (ELT). The solution, which integrates various sensors and can produce electricity or collect solar energy, is already attracting customers across the world. Why do you feel like there is a need for new railway sleepers? Giovanni de Lisi: Since 1900, we have observed a lack of innovation in the railway infrastructure sector. The concrete sleepers have been the standard for 100 years but they present several technical disadvantages, such as high noise and vibration levels deriving from the railway traffic, elevated maintenance costs, high ballast pulverisation and major exposure to atmospheric agents. There is a need for a change, a sustainable innovation, in order to follow the circular economy principles. This is exactly what Greenrail does: we offer a new product with better technical, environmental and economic performance, with the potential to become the future standard solution. How does your technology compare to alternatives in terms of sustainability and cost? The Greenrail sleeper has a unique composition which allows for reusing plastic and rubber waste, making an enormous contribution to resolving the waste management issue. It also brings technical improvements, such as better electrical insulation, the reduction of vibration, noise and ballast pulverisation, and a longer lifespan. All of these technical advantages allow for reducing the maintenance costs by around 2 to 2.5 times compared to concrete sleepers. What kind of sensors can your sleepers integrate and to what end? 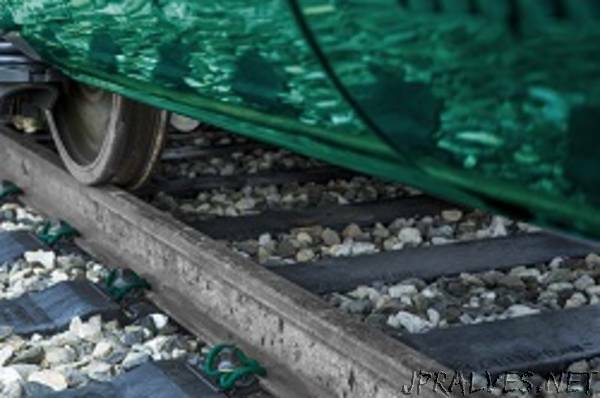 Greenrail sleepers can integrate into their structure elements such as piezo electric modules, solar panels and smart sensors to harvest energy and to communicate diagnostic data. The Greenrail Piezo is able to produce electricity, while Greenrail Solar is able to produce and to harvest solar energy. Furthermore, thanks to the integration of smart sensors, Greenrail LinkBox is able to communicate diagnostic data in order to improve the safety of the infrastructure. All of these smart Greenrail sleepers enable a move from a passive to an active infrastructure. Can you tell us more about your railway sleeper and how it works? Greenrail sleepers consist of an inner core in pre-stressed, reinforced concrete, and an outer shell obtained from a mix of rubber collected from end-of-life tyres and recycled plastics. Such a unique composition allows us to reuse up to 35 tons of these materials for each kilometre of railway line. Looking back at the initial project objectives, would you say that the project was a success? How so? The Greenrail project is on the right track. Since its beginning in October 2016, we have achieved many objectives and milestones initially foreseen in the project. We have produced the first stock of Greenrail basic sleepers and have also constructed a pilot test stretch. Greenrail has obtained Italian certification, and we are involved in R&D activities for smart Greenrail sleepers. Furthermore, the company has finalised its first commercial contract with an American company for a value of EUR 75 million. Last month we also signed an important partnership with INDRA. What are your next plans with regards to commercialisation? After the contract with the USA-based company, requests and inquiries started pouring in from all over the world. Currently, we have open negotiations with numerous entities worldwide, in Europe, the Middle East and Central Asia. Our product is tailor-made, which means it can be designed and produced according to various technical specifications. Hence, our technology is adaptable to every kind of railway, in every part of the world, making our market global. Do you intend to apply for phase 3 funding? To what end?